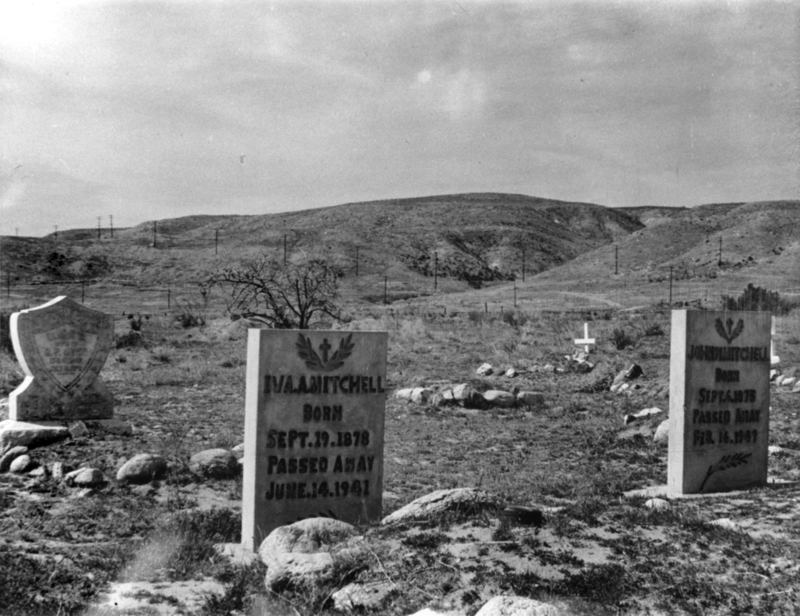 The Mitchell Cemetery (aka Mitchell-Dyer family cemetery) in present-day Canyon Country, seen here about 1961, possibly earlier. Headstones mark the final resting places of (from left) a Dyer family member; Iva A(ngeline) Mitchell, b. Sept. 19, 1878, d. June 14, 1941; and John W(esley) Mitchell, b. Sept. 6, 1875, d. Feb. 16, 1947. John and Iva were two of the six children born to Thomas F. and Martha (Taylor) Mitchell, who married in 1865  five years after Thomas F. established a homestead at the near the present-day junction of Lost and Sand Canyon Roads. The family plot was located on a bluff overlooking the opposite bank of the Santa Clara River. Thomas F. Mitchell (b. Dec. 24, 1827, d. 1907) and Martha (b. Dec. 24, 1847, d. Aug. 10, 1905) are buried there, as are some 20 descendants and other followers including certain Helveys and Hiettes, which families labored in the borax works. The original gravestones are long gone, having been replaced with smaller cement blocks bearing a metal plaque. In the modern period, visitors continue to leave pennies and small trinkets on the grave markers, ostensibly to pay Charon's fee. The cemetery property is owned by the company that is preparing, as of 2012, to build the Vista Canyon Ranch mixed-use development project. Plans call for the graveyard to be preserved in perpetuity as open space. Note: Perkins' census included Gus LeBrun (1884-1924), but that's wrong. Gus LeBrun is buried in the Ruiz Cemetery as seen here. Tales of Lang and Soledad: The Story of an Adobe by A.B. Perkins, 1961. George Walters and the Dyer Family by Jo Ellen Rismanchi, 1998. Solemint's Early Neighbors: Memories of Mary Warmuth Sathre and Friends by Jo Ellen Rismanchi, 2001.